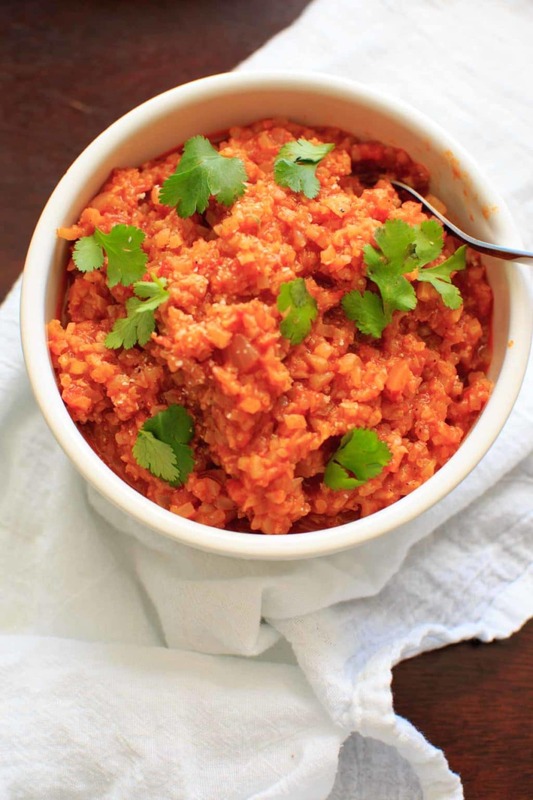 Spanish Cauliflower Rice – a grain-free substitute for Spanish rice that’s quick and healthy. Vegan and gluten-free option. When I was younger, I convinced myself I didn’t like Mexican food. Maybe it was all the beans, or the fact that I didn’t know the difference between an enchilada and a fajita. Also not eating meat limited options. But one thing I always liked was Mexican rice. Obviously every restaurant would have a different version of this, but for the most part it was something I could count on liking. Luckily I’ve changed my mind on Mexican food in general, but I still have a nostalgia for the red rice that was my trusted go-to. I’ve talked about how to make cauliflower rice before, and also how I “cheat” and buy the pre-riced version at Trader Joe’s. Whatever helps you eat it, people. 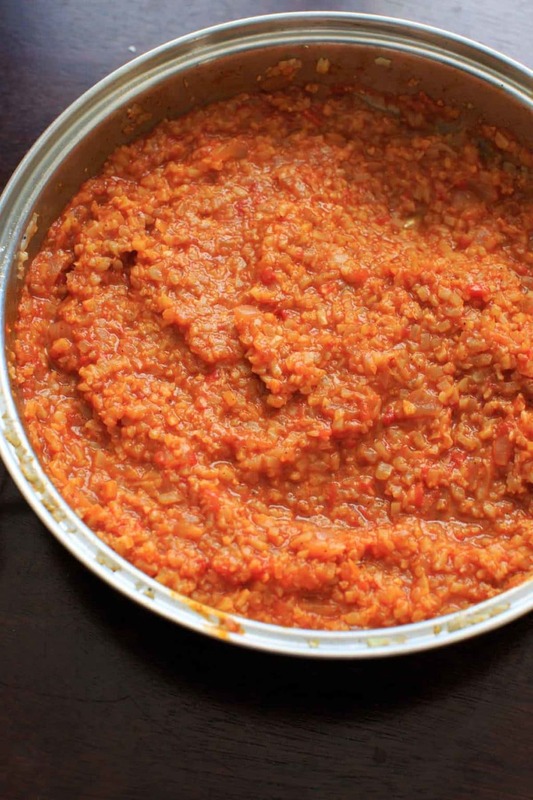 For regular Spanish rice, I’ve seen versions that use tomato paste, tomato sauce, or just plain tomatoes. 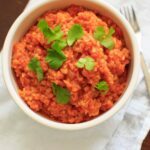 Very similar to my enchilada sauce recipe (which is what I used for this cauliflower rice), where there are many versions and consistencies. My enchilada sauce already has a lot of spices in it, so if you use a different kind of sauce you may need to add some more spices. I only added garlic salt, lime, and cilantro since the enchilada sauce already has chili powder, cayenne, cumin, onion powder and garlic. Once again I used avocado oil to saute the onion, or you can use olive oil. Then stir-fry the cauliflower and a little vegetable stock, and add the enchilada sauce. 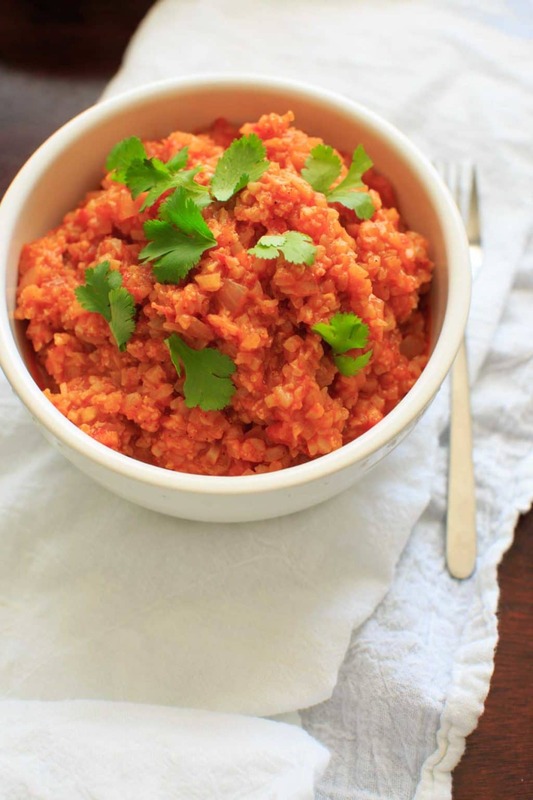 Let it simmer for about 20 minutes and you’ve got yourself a healthy veggie side. I say the lime juice is optional, but I really think lime juice adds so much to dishes like these. The cilantro is mostly for garnish, so no worries if you leave off if you’re one of the 10% who hate it. 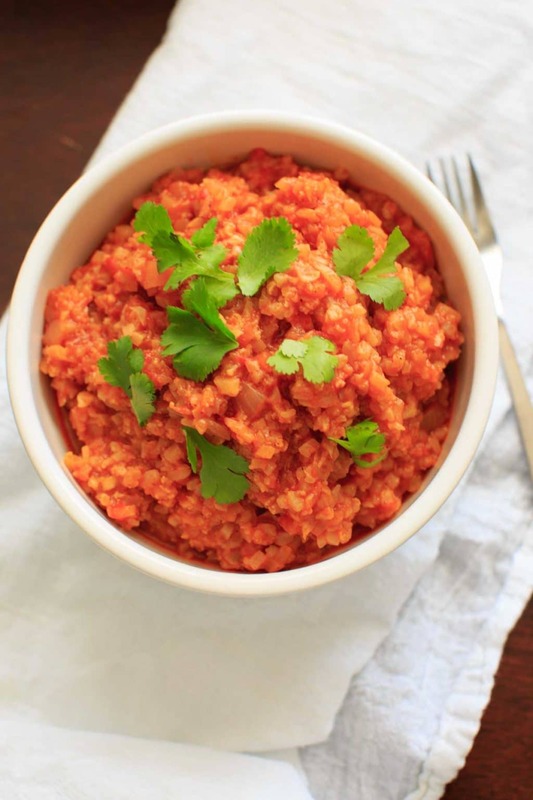 Spanish Cauliflower Rice - a grain-free substitute for Spanish rice that's quick and healthy. Vegan and gluten-free option. Heat oil in a pan over high heat. Add in chopped onion and stir for a minute, until translucent. Add in riced cauliflower and vegetable stock. Bring back to a boil and stir for several minutes. Add in enchilada sauce, reduce heat to low and cover. 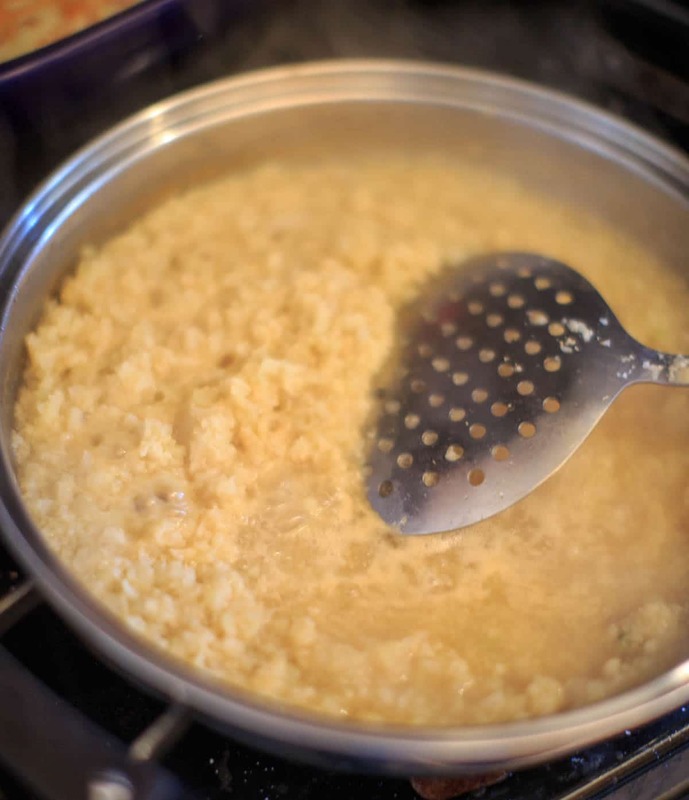 Let simmer for 15-20 minutes until most liquids have absorbed. Squeeze in lime juice and choice of spices, top with cilantro. The spices needed will depend on what enchilada sauce you use. If you use this homemade enchilada sauce, it already has chili powder, cayenne pepper, cumin, and garlic powder. If you use a different sauce you may need to add some of those spices in after tasting. I only needed a little garlic salt and lime juice. *If needed to be gluten-free, make sure you buy gluten-free enchilada sauce or use gluten-free flour in the homemade version.